(Nanowerk News) Last year Broad researchers described a single-nucleus RNA sequencing method called sNuc-Seq (Science, "Div-Seq: Single-nucleus RNA-Seq reveals dynamics of rare adult newborn neurons"). This system enabled researchers to study the gene expression profiles of difficult-to-isolate cell types as well as cells from archived tissues. 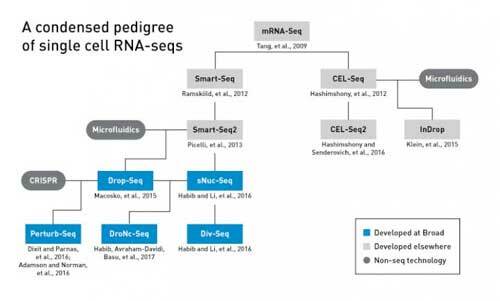 Now a Broad-led team has overcome a key stumbling block to sNuc-Seq's widespread use: scale. In a paper published in Nature Methods ("Massively parallel single-nucleus RNA-seq with DroNc-seq"), postdoctoral fellows Naomi Habib, Inbal Avraham-Davidi, and Anindita Basu; core institute members Feng Zhang and Aviv Regev; and their colleagues reveal DroNc-Seq, a single-cell expression profiling technique that merges sNuc-Seq with microfluidics, allowing massively parallel measurement of gene expression in structurally-complicated tissues.